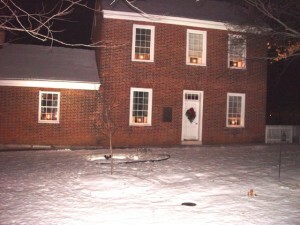 Sappington House on night of “Crestwood, Nite of Lights” Friday, December 6, 2013. Feel the fun, get the glow! enjoy caroling by Girl Scouts, hot cocoa and cider; see 620 Combat Support Battalion, Crestwood fire truck, bonfires; walk along Grant’s Trail from Big Bend to Watson Road lit with luminaries supporting our military through the efforts of USA Cares. Parking available on school lot across the street. Buy a luminary to light Grant Trail and to honor a veteran in your life. See more below. Donate $5 to honor your service person on a luminary. Contact www.giveandglow.info or 314-484-1094 by Tuesday, December 1st. Or call Sappington House at 314-822-8171. See the Nov 26, 2015 article in the South County Times about Nite of Lights, Give and Glow. See KSDK announcement of Nite of Lights, Give and Glow. The following outlines the promotional advantages for your company or organization of being a sponsor for the third annual Nite of Lights – Give and Glow. It is an excellent opportunity for your company or organization to get your name in front of local consumers and supporters. 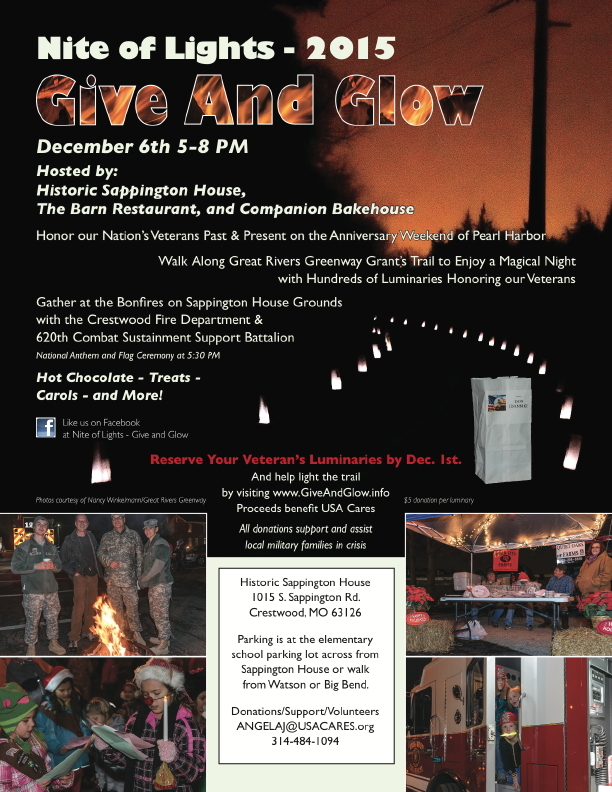 The community event, benefiting USA Cares, will be held at historic Sappington House, 1015 S. Sappington Road 63126 on December 6, 2015 from 5 to 8 p.m.
USA Cares, founded after 9/11, is a non-profit whose mission is to help current and recently discharged military personnel and their families by meeting practical and financial needs, usually responding within 48 hours of their request. In over 11 years, USA Cares has provided in excess of $11 million to help service persons and their families in crisis. Join in this FREE community, family event (pet friendly, too) and for a good cause! Enjoy complimentary warm drinks and treats at The Barn restaurant. 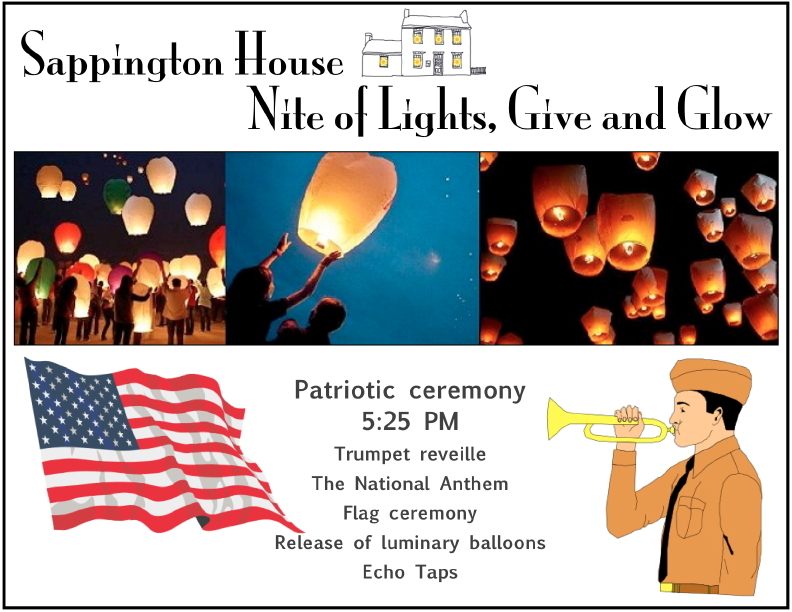 NEW for 2015: About 5:40 p.m. after a trumpet reveille, there will be a flag ceremony and Star-Spangled Banner performance. Experience the Loft Gift Shop which has undergone an extreme makeover and is restocked with “Rustic American Chic” gifts. See why Riverfront Times readers chose the Loft for the 2015’s Best St. Louis Gift Shop! Visit the Thomas Sappington House Museum, built during Thomas Jefferson’s presidency, for a free, first-floor tour. And before the trumpet taps closes the evening, special luminary balloons will be launched into the night sky! Everyone come and experience this community event on the anniversary weekend of Pearl Harbor! Individually, you can honor YOUR military member or veteran by donating $5 to USA Cares at giveandglow.info. His/her name and branch of service will appear on a luminary. Deadline, Tuesday, December 1. OR you can honor someone special by donating $25 to USA Cares at giveandglow.info. This service person or veteran’s name and branch will be displayed on an illuminated balloon to be launched. Deadline Tuesday, November 17. Corporately, your business can sponsor the event at either the $100, $250 or $500 level. Please see the promotional advantages for your company by requesting the sponsorship document. Deadline Tuesday, November 17. And of course, on the afternoon of December 6th, you can volunteer to help light Grant’s Trail, either as an individual or a business It’s a big job! Contact Angela Jett at 314-484-1094 or by e-mail angelaj@usacares.org, for more information. Click below and learn how USA Cares makes significant differences in the lives of those who have given so much in defense of our country. And see how you can become involved locally. If you have any questions or want to sign up your business for a sponsorship, please e-mail me in reply or phone me at 314-822-8171. Thank you for kind consideration in sponsoring this year’s Give and Glow. I look forward to meeting with you, and hopefully seeing you and yours on December 6th at Sappington House! Get a luminary to honor a veteran in your life. August 21, 2015 in Related Events in Area.